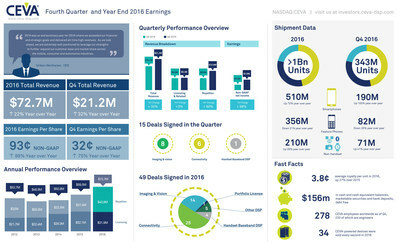 MOUNTAIN VIEW, Calif., Feb. 1, 2017 /PRNewswire/ -- CEVA, Inc. (NASDAQ: CEVA), the leading licensor of signal processing IP for smarter, connected devices, today announced its financial results for the fourth quarter and year ended December 31, 2016. Total revenue for the fourth quarter of 2016 was $21.2 million, a 32% increase compared to $16.1 million reported for the fourth quarter of 2015. Fourth quarter 2016 licensing and related revenue was $8.3 million, an increase of 3% when compared to $8.0 million reported for the same quarter a year ago. Royalty revenue for the fourth quarter of 2016 was $12.9 million, an increase of 60% when compared to $8.0 million reported for the fourth quarter of 2015. Gideon Wertheizer, Chief Executive Officer of CEVA, stated: "CEVA had a strong fourth quarter, posting record revenues for the fourth quarter in succession. Licensing strength was underpinned by eight agreements for our imaging and vision technologies, further entrenching CEVA as a de-facto industry standard for intelligent vision processing. In royalties, we achieved record revenue and shipments driven by smartphones and Bluetooth-enabled devices." Mr. Wertheizer continued: "2016 was an extraordinary year for CEVA where we exceeded our financial and strategic goals and delivered all-time high revenues. A record forty-nine licensing agreements were concluded, forty-five of which were for non-handset baseband and seventeen were with first-time customers. Our 2016 results illustrate that we have successfully transformed CEVA into a vertically integrated, one-stop IP house for wireless broadband and IoT-related technologies. Our unique portfolio of LTE-Advanced and 5G baseband, Bluetooth, Wi-Fi, imaging, vision and voice platforms continue to set new milestones in innovation and customer traction. As we look ahead, we are extremely well positioned to leverage our strengths to further expand our customer base and market share across the mobile, consumer and automotive industries and grow our licensing business and future royalty streams." U.S. GAAP net income for the fourth quarter of 2016 increased 126% to $5.2 million, compared to $2.3 million reported for the same period in 2015. U.S. GAAP diluted earnings per share for the fourth quarter of 2016 increased 118% to $0.24 from $0.11 a year ago. Non-GAAP net income and diluted earnings per share for the fourth quarter of 2016 were $7.0 million and $0.32, respectively, representing a 98% and 88% increase, respectively, over the $3.6 million and $0.17 reported for the fourth quarter of 2015. Non-GAAP net income and diluted earnings per share for the fourth quarter of 2016 excluded: (a) equity-based compensation expense, net of taxes, of $1.5 million, and (b) the impact of the amortization of acquired intangibles, net of taxes, of $0.3 million associated with the acquisition of RivieraWaves. Non-GAAP net income and diluted earnings per share for the fourth quarter of 2015 excluded: (a) equity-based compensation expense, net of taxes, of $1.2 million, and (b) the impact of the amortization of acquired intangibles, net of taxes, of $0.2 million associated with the acquisition of RivieraWaves. During the quarter, CEVA completed fifteen license agreements. Nine of the agreements were for CEVA DSP cores, platforms and software and six were for CEVA connectivity IPs. Fourteen of the licensing agreements completed during the quarter were for non-handset baseband applications and one was for a handset baseband application. Four were with first-time customers for CEVA. Target applications for customer deployment are: imaging and vision processing in smartphones, automotive ADAS, smart surveillance cameras and mirrorless cameras; cellular baseband for smartphones; storage, Bluetooth 5 and Wi-Fi connectivity for various IoT devices. Geographically, four of the deals signed were in the U.S. and eleven were in the APAC region. Total revenue for 2016 was $72.7 million, an increase of 22% compared to $59.5 million reported for 2015. Royalty revenue for 2016 was $40.8 million, representing an increase of 49% compared to $27.4 million reported for 2015. Licensing and related revenue for 2016 was $31.9 million as compared to $32.1 million reported for 2015. U.S. GAAP net income and diluted net income per share for 2016 were $13.1 million and $0.61, respectively, an increase of 109% and 103%, respectively, compared to $6.3 million and $0.30, respectively reported for 2015. Non-GAAP net income and diluted earnings per share for 2016 were $20.4 million and $0.93, respectively, also representing an increase of 82% and 75%, respectively, over $11.2 million and $0.53 reported for 2015. Non-GAAP net income and diluted earnings per share for 2016 excluded (a) equity-based compensation expense, net of taxes, of $6.0 million, and (b) the impact of the amortization of acquired intangibles, net of taxes, of $1.2 million associated with the acquisition of RivieraWaves. Non-GAAP net income and diluted earnings per share for 2015 excluded (a) equity-based compensation expense, net of taxes, of $4.0 million, (b) the impact of the amortization of acquired intangibles, net of taxes, of $0.9 million associated with the acquisition of RivieraWaves, and (c) $0.1 million, costs associated with the acquisition of RivieraWaves. Yaniv Arieli, Chief Financial Officer of CEVA, stated: "We are extremely proud of our financial performance in 2016. We delivered annual revenue growth of 22% and non-GAAP diluted EPS growth of 75% year-over-year. We continued to strengthen our balance sheet in 2016 with our cash balance, marketable securities and bank deposits growing annually by $17 million to reach $156 million at the end of the year, after buyback activity of $3.4 million and the final payments relating to the acquisition of RivieraWaves of $2.2 million. All in all, we are encouraged by a healthy outlook on the back of a robust licensing environment and new production ramps from our non-handset baseband customers." On February 1, 2017 CEVA management will conduct a conference call at 8:30 a.m. Eastern Time to discuss the operating performance for the quarter. The conference call will also be available live via the Internet at the following link: https://www.webcaster4.com/Webcast/Page/984/19106. Please go to the web site at least fifteen minutes prior to the call to register, download and install any necessary audio software. For those who cannot access the live broadcast, a replay will be available by dialing 1-877-344-7529 or +1-412-317-0088 (access code: 10098567) from one hour after the end of the call until 9:00 a.m. (Eastern Time) on February 08, 2017. The replay will also be available at CEVA's web site www.ceva-dsp.com. CEVA is the leading licensor of signal processing IP for a smarter, connected world. We partner with semiconductor companies and OEMs worldwide to create power-efficient, intelligent and connected devices for a range of end markets, including mobile, consumer, automotive, industrial and IoT. Our ultra-low-power IPs for vision, audio, communications and connectivity include comprehensive DSP-based platforms for LTE/LTE-A/5G baseband processing in handsets, infrastructure and machine-to-machine devices, advanced imaging, computer vision and deep learning for any camera-enabled device, audio/voice/speech and ultra-low power always-on/sensing applications for multiple IoT markets. For connectivity, we offer the industry's most widely adopted IPs for Bluetooth (low energy and dual mode), Wi-Fi (802.11 a/b/g/n/ac up to 4x4) and serial storage (SATA and SAS). Visit us at www.ceva-dsp.com and follow us on Twitter, YouTube and LinkedIn. This press release contains forward-looking statements that involve risks and uncertainties, as well as assumptions that if they materialize or prove incorrect, could cause the results of CEVA to differ materially from those expressed or implied by such forward-looking statements and assumptions. Forward-looking statements include CEVA's imaging and vision technologies being a de-facto industry standard for intelligent vision processing; CEVA is transforming into an one-stop IP house for wireless broadband and IoT-related technologies; CEVA being well positioned to expand its customer base and market share across the mobile, consumer and automotive industries and grow its licensing business and future royalty streams; and a healthy outlook for CEVA for continued licensing and royalty growth due to a robust licensing environment and new production ramp-ups by non-baseband customers. The risks, uncertainties and assumptions include: the ability of the CEVA DSP cores and other technologies to continue to be strong growth drivers for us; our success in penetrating new markets and maintaining our market position in existing markets; the ability of products incorporating our technologies to achieve market acceptance, the speed and extent of the expansion of the 4G, 5G and LTE networks, the maturation of the IoT market, the effect of intense industry competition and consolidation, global chip market trends, the possibility that markets for CEVA's technologies may not develop as expected or that products incorporating our technologies do not achieve market acceptance; our ability to timely and successfully develop and introduce new technologies; and general market conditions and other risks relating to our business, including, but not limited to, those that are described from time to time in our SEC filings. CEVA assumes no obligation to update any forward-looking statements or information, which speak as of their respective dates.